Today, the impala may be heralded as the most abundant antelope in South Africa. 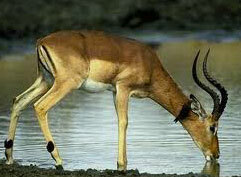 It is also one of the bigger medium-size antelopes and therefore one of the most sought after by hunters. This is all the more true, while the Impala ram features a pair of the most beautiful horns and it is thus a wanted trophy for many hunters. But Eco-tourists and photographers are just as fond of the Impala as a very special antelope of the South African bush: the incredible leaping abilities of the impala, the well defined shades of the white tummy, light brown and a very red-brown upper parts of the impala's body. When disturbed, a flock of impalas makes for the most dazzling circus-like gymkhana of all antelopes, jumping up to three meters high, over bushes, or hurdles in only flashes of seconds, incredibly fast, and in all directions. The impala naturally falls prey to many of the bigger carnivores, and is always on the alert at an unwelcome sound or smell. In early winter, during the mating season in the South African bushes, fierce fighting occurs between the rams. Because not all males are allowed near the female flock, fighting determines if the impala is the mating male or destined to be part of a herd of rams only. The impala can be noisy when fighting. When it senses direct danger, a loud snorting sound is heard. It is frustrating to a hunter/photographer, because mostly the impala will notice you long before the shot/photo is taken. The impala prefers to dwell in a combination of grassland and bushes and will keep in a fairly small, familiar habitat.